All transactions are safe and secure with a reliable history in online purchasing behind each of our associates. 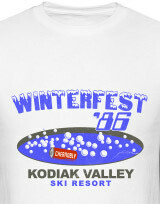 Buy the Winterfest Kodiak Valley t-shirt to own Hot Tub Time Machine clothing and merchandise. Head to the Kodiak Valley Ski Resort for Winterfest. This design lets everyone know that you were there in '86 hanging out with Lou, Adam and Nick. Wear it to recite your favorite movie quotes like, "Relax, it's only pee." If the hospital scene with Lou left you laughing, then pair this design with a It's Only Pee Hot Tub Time Machine shirt that is bound to get your friends chuckling too. Order it with the Sup Dawg t-shirt below. In addition to the Winterfest Kodiak Valley tee above, browse the Hot Tub Time Machine Clothing Gallery for more apparel like men's and women's clothes, kids shirts or hoodies.